Home » Can't Get iMovie to Import MPEG-2 Files, Fixed! Can't Get iMovie to Import MPEG-2 Files, Fixed! "How can I get iMovie 10.1 to import MPEG-2 (3AAC) format files taken on a Sony Handycam. iMovie 10.1 is a good update! It should accept these MPEG-2 files." 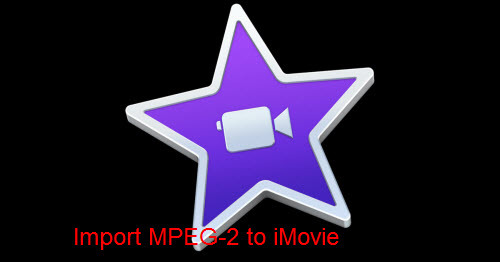 Why can't import MPEG-2 to iMovie? After searching for iMovie supported editing formats, we find that iMovie has included input support for MPEG-2 files. The big issue is that there are still fail to import MPEG-2 into iMovie or suffer other video editings issues when loading MPEG-2 into iMovie. The following article will illustrate them for you and offer the correspont solutions. On rare occasions, some video clips may not import correctly into iMovie when you use the "Import from Camera" window. You may see an alert similar to the one below. 1. From the File menu, choose Import > Movies. 2. In the dialog that appears, select your camera from the sidebar. 3. Locate and select the video clips on your camera that you would like to import. 4. Click the Import button. These video clips should now import into iMovie. 1. Make sure the audio track has not been muted in the timeline. 2. See if the volume in iMovie is set to its lowest, if this is the case, set the volume slider to maximum. 3. Make sure the computer's audio is not muted. 4. Quit and reopen iMovie, then check the clip to see if it now plays with audio. 5. Quit and reopen iMovie, then reimport the footage. Play the newly imported footage and see if you now have audio. 6. If you are using an analog to DV converter instead of a camera, make sure the audio connections are good between your VCR or other analog device and the converter. Check the documentation that came with your converter for more information. 7. Check /Library/QuickTime/ and ~/Library/QuickTime/ for any third-party plugins. Remove them if present, log out, and log back in. Check to see if the issue persists. If not, check with the manufacturer of the disabled plugin to see if an update is available. Note: The tilde (~) represents your Home directory. 8. Check to see if any of the video clips you have imported are in the MPEG-1 format. MPEG-1 clips will lose audio when you export them as part of your iMovie project. If you can't solve iMovie no sound problems with the first 7 steps, then the issue can be caused due to the last reason, your MPEG-2 video may contain some MPEG-1 audio which are not supproted by iMovie. To fix this issue, you can download a third-party program like Pavtube HD Video Converter for Mac to convert the unsupported MPEG-1 audio in MPEG-2 video to iMovie readable MP3 or AAC audio codec. Some HDV footage you captured you use a compression scheme which is called Long-GOP MPEG-2, which uses temporal compression, enabling every frame to be decoded immediately without decoding other frames. Therefore, the decoding demands on your computer will be increased which cause the video editing workflow very processor-intensive. To fix this issue, it would be much ideal for you to transcode MPEG-2 to iMovie less processor-intensive format - Apple Intermediate Codec (AIC) format, which can also be generated with Pavtube HD Video Converter for Mac directly. Besides MPEG-2, the program can also do you a great favor to convert other incompatible file format such as MP4, AVI, MKV, MOV, WMV, etc video to iMovie editable file formats and less-processor intensive Apple Intermediate Codec. How to Convert MPEG-2 for iMovie Best Editing Workflow? Step 1: Load MPEG-2 files. Run the program on your Mac computer and click "File" > "Add Video/Audio" or "Add from folder" to add MPEG-2 files into the program. Step 2: Select output file format. 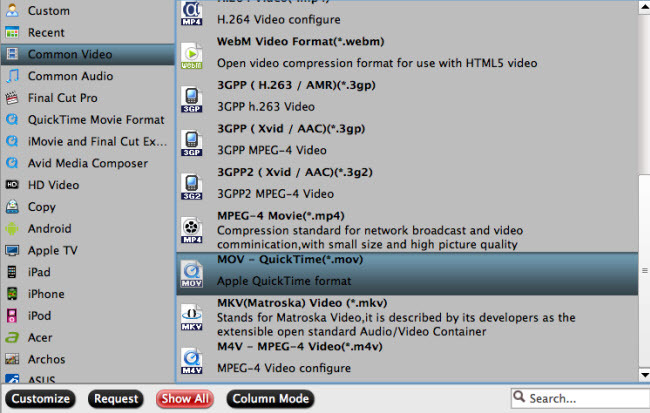 Click "Format"bar, from its drop-down list, output one of iMovie supported editing file formats such as "MOV - QuickTime(*.mov)" under "Common Video" drop-down list. You can also choose to output other iMovie supported editing formats accoring to your own needs. 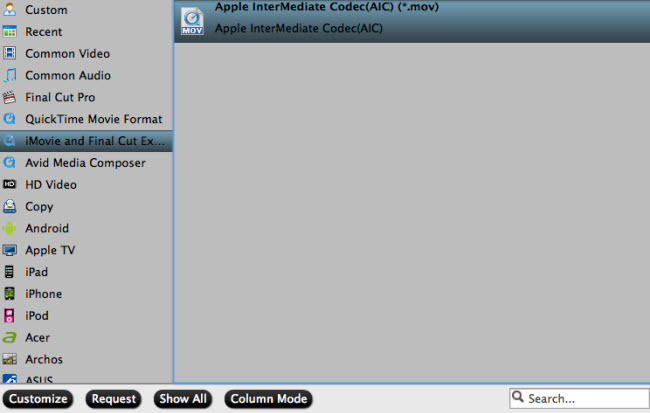 For editing MPEG-2 files with iMovie on slow computer, you are recommended to output the less processive intensive "Apple Intermediate Codec(AIC)(*.mov)" under "iMovie and Final Cut Ex..." drop-down list. Step 3: Adjust the output audio codec. If there is an MPEG-1 audio in MPEG-2 video, you can solve iMovie no sound issue by adjust the output audio codec as "AAC" or "MP3" in the program's profile settings window. Step 4: Start the conversion process. Go back to the main interface, click the right-bottom "Convert" button to begin the conversion from MPEG-2 to iMovie supported video and audio formats conversion. When the conversion is completed, click "Open Output Folder" on the main interface to pop out the folder with converted files. You will then have no problem to import video to iMovie editing on MacOS Sierra. How to Convert ASF to iMovie (iMovie 11 Included) on Mac?